From manual to automatic transmission repair, Cape Elizabeth Service Center in Cape Elizabeth, ME 04107 knows how to fix the problem. Our knowledgeable auto experts will diagnose the situation and help you make a decision. Leave the dirty work to us! Automatic Transmissions shift between gears automatically to optimize driving, and changes gears based on the driver's throttle pedal, vehicle speed, engine speed, and vehicle load. Typical automatic transmissions have 4-5 forward gear ratios, a Reverse, Park, and Neutral gear. Shifting gears occur automatically once the car is in Drive and there is no need for a clutch pedal or gear shift like there is in a Manual Transmission. Automatic transmission repair is complicated based on all the components that make it up, and you need to have any automatic transmission issues properly assessed by auto mechanics. 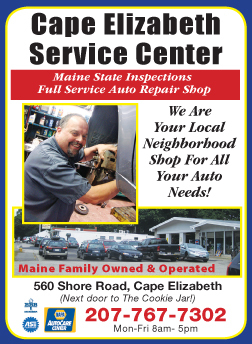 Call 207-767-7302 to talk to the mechanics of Cape Elizabeth Service Center about your transmission problems. There are clutches in both automatic and manual transmission cars, and different types of clutches. When shifting gears, the clutch engages and disengages from the flywheel and transfers the torque through the transmission. Clutches should help your vehicle start and shift gears smoothly. The clutch in your car receives a lot of wear and can eventually wear out. If your clutch begins slipping irregularly or is making noises that are raising suspicion, contact Cape Elizabeth Service Center to see if clutch replacement is necessary. A four-wheel (4x4) drive vehicle has differential gears, both front and rear axles, and a transfer case attached to the transmission. Four-wheel drive vehicles demand maintenance on the transfer case, front differentials, rear differentials, and transmission fluids. Visit us on 560 Shore Road for service on your four-wheel drive transmission services. If your vehicle has Front-wheel drive, the engine drives the front wheels only. The power is routed through the transmission to the final drive where it is split and sent to the two front wheels through the drive axles. The engine, transmission, and additional hardware is all located in the front of the car. If you are in need, Cape Elizabeth Service Center of Cape Elizabeth, ME will gladly repair front-wheel drive transmission vehicles. Driving a vehicle with a Manual Transmission requires using the clutch pedal and gear shift to manually shift gears based on the speed of the vehicle. Manual transmissions have been built with anywhere from two to eight gears. Front-wheel drive and rear-wheel drive are the two main configurations for manual transmissions. Typically, manual transmissions require less maintenance then automatic transmissions. At Cape Elizabeth Service Center, our auto mechanics can diagnose your vehicle and then recommend the transmission repair or transmission service you need to ensure safety and improve the lifetime of your vehicle. In motor vehicles, the transmission usually refers to the gear box, which uses gears and gear trains to transmit speed and tourque from a rotating power source to another device. You can have your car's transmission replaced with a new, rebuilt, remanufactured, repaired or used transmission. For more information contact Cape Elizabeth Service Center in Cape Elizabeth, ME. Our experienced service technicians can help you make the best decision for your vehicle and your wallet. Transmission repair is not something to take lightly. The transmission is connected to key parts of your vehicle and needs to be working properly for your safety. Transmission services include replacing filters and draining fluids to prevent transmission damage. Typical transmission issues that may lead to repair may include shifting issues, slipping, stalling, fluid leaking, and the service light turning on. If you are concerned that you may need transmission repair, don't hesitate to schedule an appointment at Cape Elizabeth Service Center today. A transfer case is a part of a four wheel drive system found in four wheel drive and all wheel drive vehicles. The transfer case receives power from the transmission and sends it to both the front and rear axles. This can be done with a set of gears, but the majority of transfer cases manufactured today are chain driven. The transfer case is connected to the transmission and also to the front and rear axles by means of drive shafts.Trust the automotive experts at Cape Elizabeth Service Center for all your transmission repairs.